Easy-To-SeeTM thermostats are specially designed for anyone with decreased vision or limited hand strength. High-contrast markings and a low-glare design make it easier to see the current temperature setting. 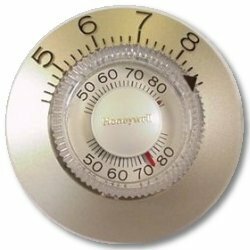 The temperature setting scale and switch markings are raised, for easy recognition by sight or by touch. A large, grip-able dial and click-detents provide audible and tactile feedback for every two degrees of movement. East-To-SeeTM thermostats are available for low voltage conventional or heat pump systems. Subbase for Air Conditioner. Heating and cooling subbase for independent Heat-Cool circuits.